Food additives are substances added to food to preserve flavour or improve its taste and appearance. Some additives like salt, sugar and vinegar have been used to preserve foods for centuries. With the advent of processed foods, many more additives have been introduced, of both natural and artificial origin. 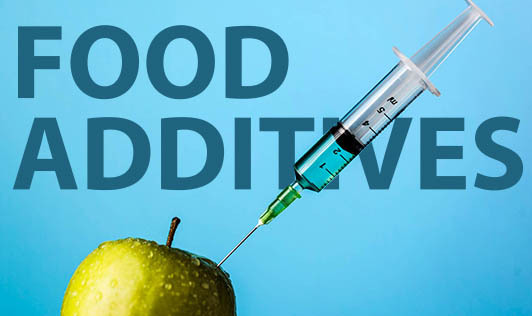 Considerable controversy has been associated with the potential threats and possible benefits of food additives. Most food additives are considered safe. However, some are known to be carcinogenic or toxic. The food additives are used to maintain the quality and consistency of food, retard spoilage, replace nutrient lost in processing. • Digestive disorders - diarrhoea and pains. • Nervous disorders - hyperactivity, insomnia and irritability. • Respiratory problems - asthma, rhinitis and sinusitis. • Skin problems - hives, itching, rashes and swelling. Food additives that are known to cause problems in some people are flavour enhancers, food colourings and preservatives. This doesn't mean that all foods containing additives need to be automatically treated with suspicion. Many of the food additives used occur naturally within foods that are regularly consumed.